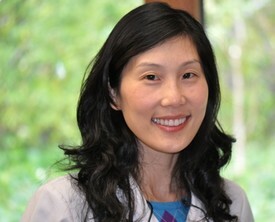 Dr. Lynne Hsia (pronounced as "Shaw") is a board certified by the American Board of Pediatric Dentistry. She brings over 10 years experience working exclusively on children and she absolutely loves it! Dr. Lynne earned her DDS degree at the highly acclaimed UOP, Dugoni School of Dentistry in San Francisco. After that, she went to New York for 2 years to complete a challenging and highly rewarding Pediatric Dental Residency at Saint Barnabas Hospital. It was that hospital staff that gave her the nicknames, "Sunshine" and "Happy Happy Doc" because of her constant upbeat personality. She's an animal lover, enjoys gardening, and always has a big smile on her face!